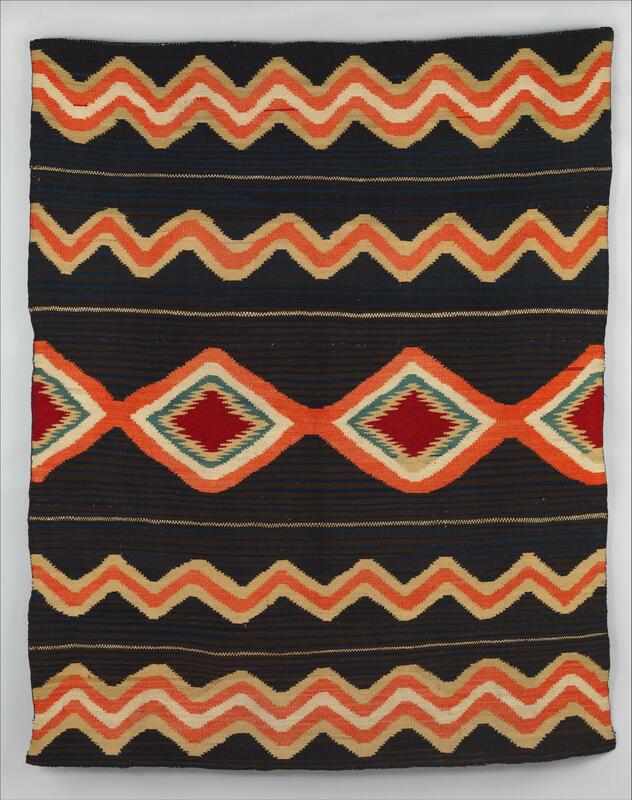 This page highlights Artstor content related to the experiences and cultural traditions of Native Americans, illustrated by historic and contemporary photographs of ceremonial scenes, architecture and landscapes, as well as studio portraits of individuals and tribal delegations. Artifacts of material culture such as baskets, textiles, tools, masks, and costumes and apparel are also available. Image credit: Navajo. Wearing Blanket. 1865-75. The Metropolitan Museum of Art; Gift of Mrs. Russell Sage, 1910; 10.107.3. To find examples of Native American musical instruments, pottery, and other utilitarian objects browse museums with encyclopedic collections (e.g. The Metropolitan Museum of Art or the Cleveland Museum of Art) and select the category for Decorative Arts and Utilitarian Objects. Search within the collection of George Eastman House to view historical photographs of Native Americans. Browse the collections of the Museum of Anthropology at the University of British Columbia to view a wide array of Native American artifacts. Try these sample search terms to find images related to Native American studies. Don't forget to use the search filters to narrow your results. Photographer Susan Silberberg-Peirce of Canyonlights World Art Image Bank has documented prehistoric and Native American sites in the Southwestern United States. In 2006, Silberberg-Peirce traveled to New Mexico to photograph ancient Pueblo and Mogollon archaeological sites and petroglyphs at Chaco Canyon, Gila Cliff Dwellings National Monument, Jemez State Monument, Salinas Pueblo Missions National Monument, Petroglyph National Monument, and Three Rivers Petroglyph Site.